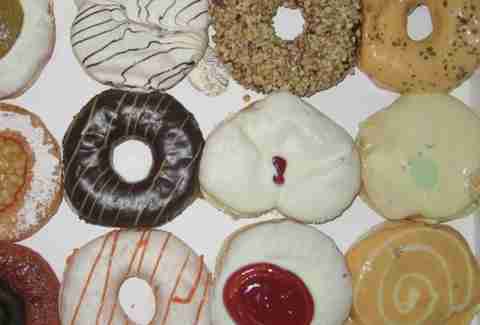 Beloved by cops and not-cops the world over, donuts are a reliably delicious way to start the day. But thanks to edgy bakers and black magic, our cherished breakfast pastries sometimes take on oddly unsavory forms, so we rounded up a few of the most unappetizing donut flavors out there and present them here for your horrified disbelief. 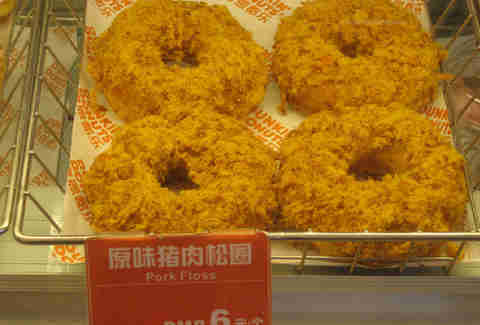 Pork and Seaweed Donut Take a trip to the Dunkin' Donuts in China, and you'll be rewarded with the truly special creation pictured above: a dry pork and seaweed donut. Just like Mom that crazy lady at the beach used to make 'em! The pastry in question is in the second row, all the way to the right, and apparently is a big deal in Singapore. Lest you think Singapore isn't weird with cheese and donuts 100% of the time, this batch also includes a "spicy cheese" flavor (right above wasabi) and a "cheese tartar" (right below). 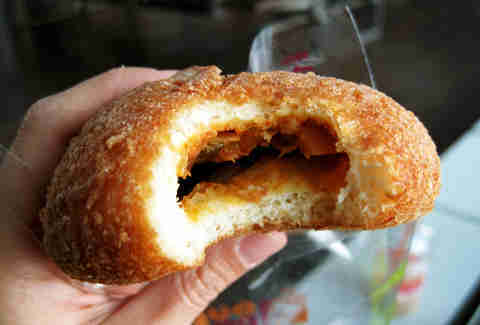 The Asian Dunkin' Donuts continue to kill it at the weird donut game with this kimchi croquette, available in South Korean chains. Also in the South Korean chains? Employees with the most incredible hats you'll see outside of actual anime. 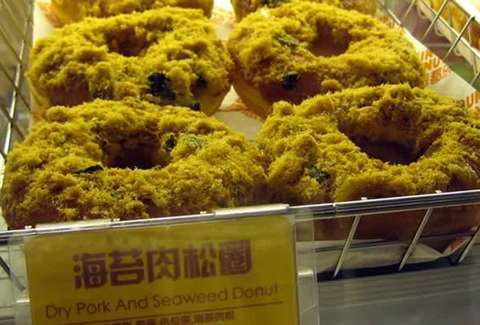 In case you were really jazzed about the pork and seaweed donut but just can't stand kelp. And also happen to be in China! On the off-chance you don't know what a kai yong donut is (and, for that, you should feel deep shame), it's another DD international delicacy, this time from Thailand. 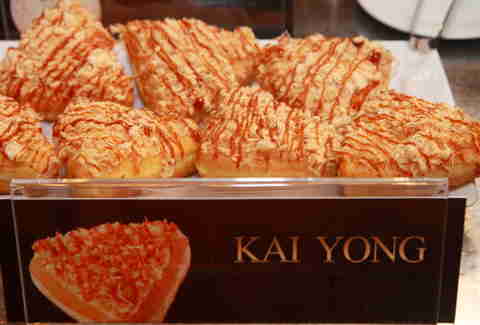 Take one glazed donut, add dry shredded chicken, drizzle with Thai chili paste, and you have this nausea-inducing wonder. That'll teach you to trust a triangular donut. Is a ham and melted cheese sandwich delicious? Of course. Is a glazed donut with strawberry jam delicious? Duh. 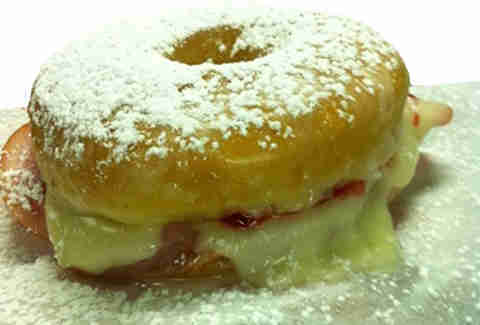 But what happens when you put them together, like South Carolina shop The Glazed Gourmet did? Short answer: You become death, destroyer of worlds.